The 0.9-mile-long loop trail through Housatonic Flats’ 26 acres gets you up close and personal with more than a half-mile of Housatonic riverbank. The floodplain is now reverting to the forest that prevailed before settlers cleared it for pasture. Attractions include abundant birdlife, fish, otter, beaver and deer. From Lee: From the Mass Pike/Big Y intersection, take Route 102 southwest toward Stockbridge. In Stockbridge turn left onto Route 7. After passing Monument Mountain, before reaching Price Chopper, look for the parking lot on the right side of the road. From Great Barrington: From the Price Chopper, head north on Route 7 for less than half a mile. Parking will be on the left. Walking clockwise, the loop trail heads due south through a seasonally flooded oxbow on a narrow causeway. Beyond the oxbow, the trail winds through abandoned pasture surrounding a silver maple floodplain forest. The trail first reaches the river at another oxbow, where there is a bench. The trail then follows the river upstream, and then heads north through abandoned pasture before turning east to return to the trailhead. Several short spurs offer views of the river. Walking the whole loop takes 20 to 30 minutes. 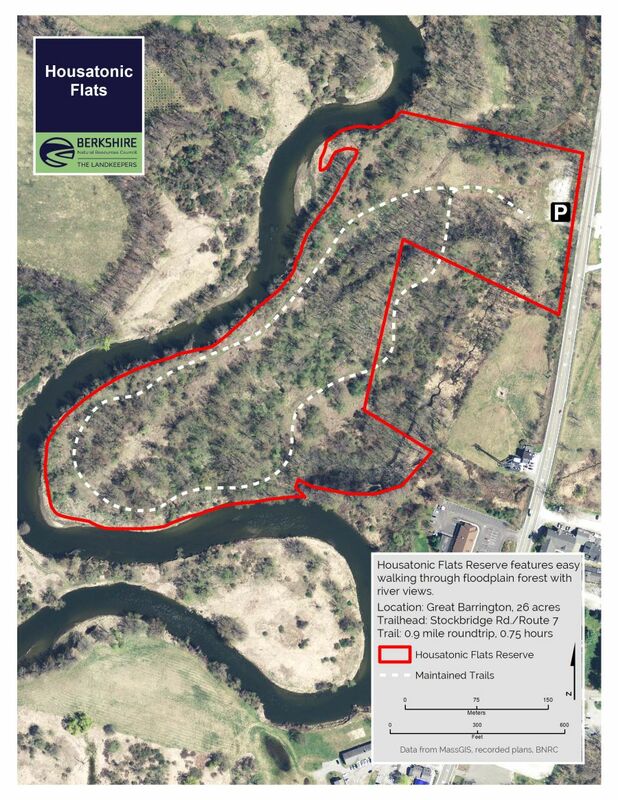 Located close to the center of Great Barrington, the Housatonic Flats reserve is a rich resource for hikers, hunters, dog-walkers, bird-watchers and anglers. 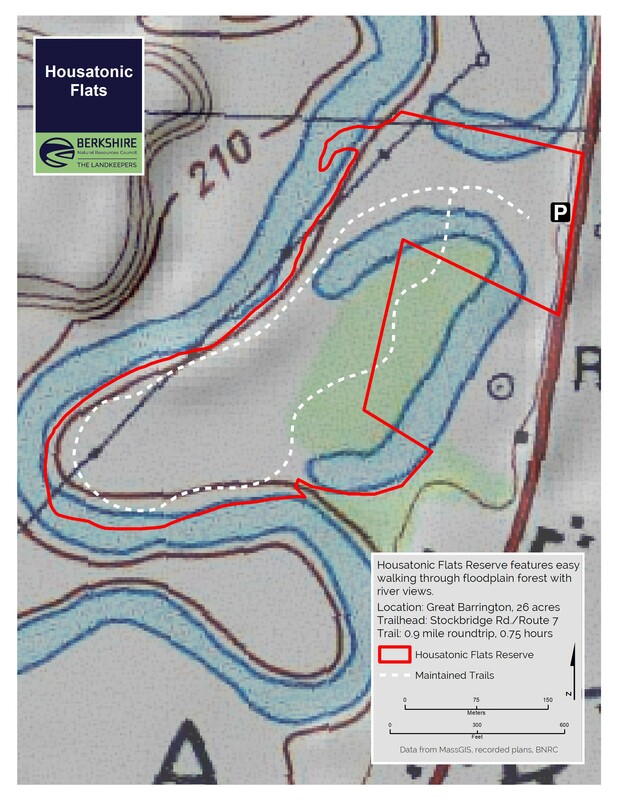 More than half of the trail tracks very close to the river, letting visitors see how the stream is undercutting the opposite bank, changing its channel. Trees—especially silver maples and cottonwoods, which do well in the wetness—are returning to the flats after its original forest was cleared for pasture. More recently, the site was used as a dump for demolition debris and a wide range of other damaging material. 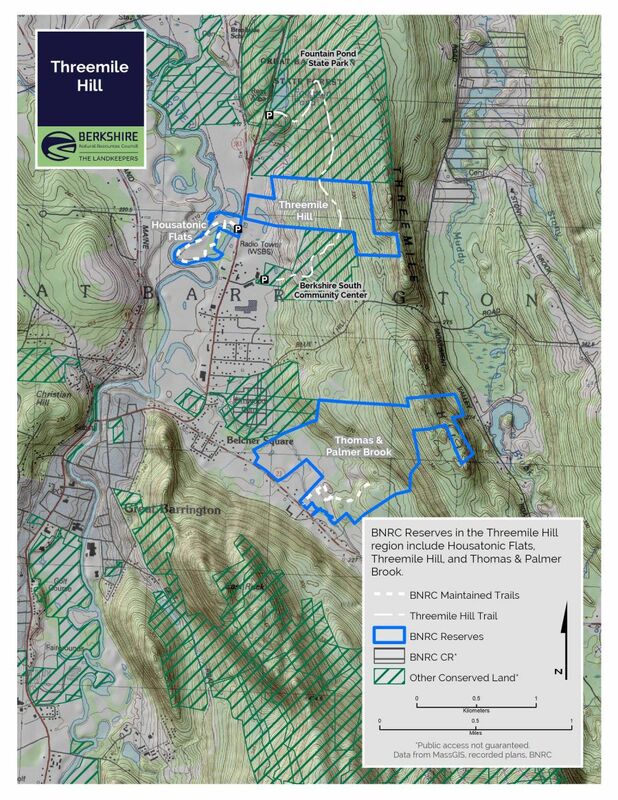 After the Berkshire Natural Resources Council acquired this property, BNRC and volunteers removed more than five tons of solid waste, concrete and barbed wire. The variety of habitats in the flats—river, forest, nearby farmland, oxbows, patches of shrub and old pasture—attracts a broad array of breeding and migratory birds. In spring as many as 50 species can be spotted. In winter snow, you can see the tracks of otter, weasels, white-tailed deer and rabbits. The river itself is home to wood ducks, common carp, smallmouth bass, among other species. Beaver are also abundant in and around the river, though you won’t see lodges like on a pond here. Keep your eye out for bank lodges, also known as bank burrows, that are built by beavers burrowing into the bank. Milkweed draws monarch butterflies. In the spring, some oxbows become functional vernal springs, breeding places for frogs and salamanders.